Mr. Sea’s carries the freshest seafood around. We are open 7 days a week, April-September. Our product comes off the boat, we load it into our truck, and unload it at Mr. Sea’s where it stays for a very short time!! We carry the freshest Lobsters, Clams, Little Necks, Lobster Salad, Clear Meat and Shore Dinners in our “live” seafood room. Oh, and don’t forget to grab a Lobster Salad Roll….they are the BEST in town!l You can also swing by our “Golden Fried Seafood” window to order a variety of hot seafood dishes, chowders, chicken and more! 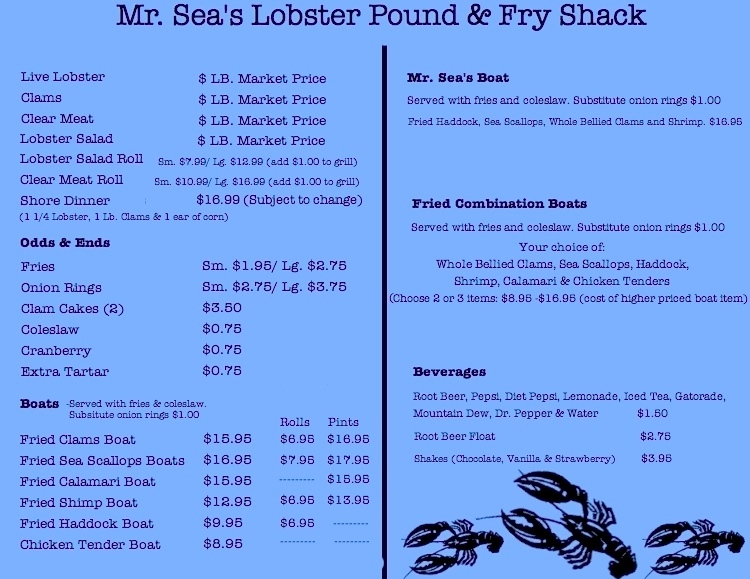 Don’t have time to cook….have no fear, Mr. Sea’s is here! Just give us a call or stop in. Mr. Sea’s is always stocked with the freshest seafood. We take very large orders as well as small orders. No order is too small or too big! Call in your order today! Our Shore Dinner is very popular. It contains a 1 1/4lb. lobster, 1 lb. clams and an ear of corn. Call ahead to order. At Mr. Sea’s you can grab your food to go or enjoy it on one of our outdoor picnic tables. Come visit us today!